Advice and tips for picking your Diamond Engagement Ring. 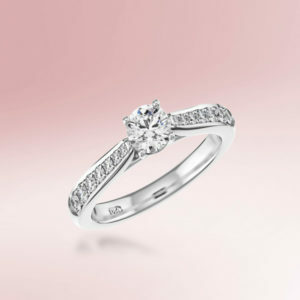 Purchasing an engagement ring is likely to be the most emotionally charged purchase of your life! This is still seen as a real financial investment and as such needs to be researched and considered really carefully. When I visited Winsor Bishop in Norwich recently they discussed with me how they go about helping confused and nervous grooms-to-be with this important milestone. Based in the Norwich Jewellery Quarter, Winsor Bishop has an enviable reputation as THE Norfolk diamond specialist. Established in 1834, they are the Norfolk flagship store for many high profile jewellery and watch brands such as Rolex, Omega, TAG Heuer and Breitling. At their store on London Street, Winsor Bishop offer future brides and grooms a stunning showroom in which to discuss and select their wedding bands, engagement ring and wedding jewellery. The Diamond Lounge is a private, luxurious space filled with the finest diamonds where Winsor Bishop can expertly guide and advise you on this significant purchase. It is such a fabulous advantage to be able to sit in a quiet space and have time to consider such an important purchase with expert assistance. It is still a lovely tradition that so many chaps decide to buy the engagement ring before they propose, so they have a ring to propose with. I can imagine this is an enormously nerve-wracking shopping trip but what became very clear, while I was chatting to the Head of Sales at Winsor Bishop, was that each of their team are highly trained and super efficient at drawing out key information from the groom-to-be to allow them to select the perfect engagement ring. Very few guys walk in knowing exactly the sort of ring that they wish to purchase. They may well have a budget they intend to spend but the rest is a minefield in their eyes! Key questions that the team would ask to help them pick the very best design would be what colour metal does your girlfriend like to wear, or what colour metal is on her watch? Asking questions about her personality and what she likes/dislikes also helps them paint a picture of the styles of rings which would be suitable. I learnt that a lot of men are worried that they don’t know their future fiancees ring size, but this is not important according to Winsor Bishop, as rings can be resized, after she has said yes! In fact, after the ring has been purchased Winsor Bishop offer a complimentary appointment to check the fitting is perfect. This is also a great opportunity to chat about how the proposal went and begin discussions about their wedding bands. I was surprised to hear that trends for engagement rings are fairly static. Diamond rings are still massively popular and the quality of the stone is paramount. The amount of sparkle a diamond (or cluster of diamonds) gives is most likely to be the characteristic your bride-to-be will fall in love with! I also learnt that ‘wedfit’ engagement rings are a very cleverly styled ring whereby a standard wedding band will snugly fit alongside, to remove the requirement of having a bespoke wedding band created to fit around the engagement ring – another important point for grooms-to-be to consider. Another popular design is The Memoire Classic, which is a classical solitaire with hand crafted micro-set diamond shoulders, set with a round brilliant cut solitaire diamond. However, for maximum sparkle, The Skye is just stunning. It features a round brilliant cut centre diamond, surrounded by a sparkling halo of smaller diamonds and finished with decadent scalloped set diamond shoulders. Colour – diamonds are not all colourless, they are graded according to their colour, D is the finest colourless ranking you can get, and the scale goes down to a Z. Most diamonds in jewellery are between a D and H.
Cut – there are many different cuts of stone, each gives a different quality to the ring. A Round Cut Brilliant is the most sparkly, with 57 facets cut into the diamond to reflect the maximum amount of light. Clarity – This refers to the flawless nature of a diamond, some have natural inclusions which are a type of blemish deep inside the stone which were formed when it was created. Some can be seen by the human eye, others can’t so this rating refers to that and it obviously effects the price of the diamond. Carat – this is how the size of a diamond is measured. The bigger the number the bigger the diamond but remember the value of the diamond is not just based on the size, it will also depend on the colour and clarity of the stone. Certification- this is like a guarantee about the origins and quality of the diamond you are purchasing. The certification is given by an independent laboratory and details all the unique characteristics as mentioned above. For those lucky ladies who have their wedding bands and engagement rings purchased at Winsor Bishop, they are entitled to join their Something Borrowed scheme. This is a unique service whereby the bride can ‘borrow’ her wedding jewellery from them for her big day to complete her bridal look. She is invited into the Diamond Lounge for an exclusive experience with either the Mother of the Bride or a Bridesmaid to try on pieces and choose from the collection a set of jewellery to complete her bridal look. Selected jewellery is couriered to your bridal dress fitting for you to try with your dress and then it is delivered directly to you for you to borrow on your wedding day. Your engagement ring is something you will wear forever (hopefully) and most days, so it is really important that there is an after-care service in place and Winsor Bishop have this down to a fine art. 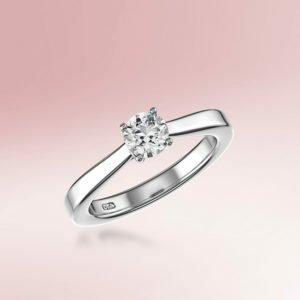 After you have said yes, you will have your ring professionally fitted in store. It comes with a 2 year warrantee and a check after 6 months to make sure the setting is still holding your diamonds in place properly. 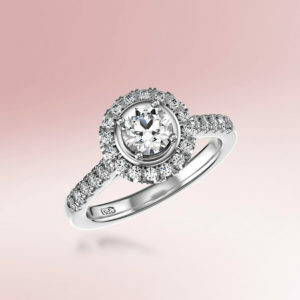 Following up with complimentary polishing is also a real treat to get your ring looking as sparkly as possible! If you are looking for a truly personal yet professional service where they really understand you and what you are looking for then the service provided by Winsor Bishop is undoubtedly that. It is not as simple as picking a diamond ring from a jeweller’s window and nor should it be. This purchase is likely to become an heirloom and an important piece of your relationship history. For all those chaps out there considering proposing on Valentine’s day I can highly recommend a trip to these experts as I am sure they will completely look after you and take away any concerns you may have. If you are after some help, inspiration and guidance for the actual proposal then do get in touch with me to hear more about my Proposal Planning Service. In the meantime, enjoy the sparkles in this promotional video from Winsor Bishop. Watch the Winsor Bishop Proposal Video #PressTheButton here. Many thanks to Winsor Bishop for sharing the images and video in this post with me.